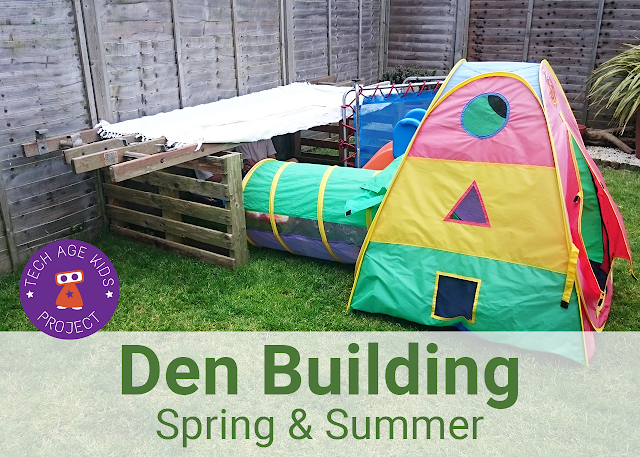 Den building is great fun indoors in the winter, but with nicer weather in Spring it's time to take your den building skills outdoors. Yes, you read it right, kids learn design and engineering skills when building dens. The best dens are made with things you find laying around - a den made of sticks found in the forest or a piece of waterproof canvas stretched between a couple trees. It helps sometimes to have a starting point using a Den Building Kit or perhaps a quick-fix den with a Pop-Up Tent and cushions in the garden / backyard. I've previously written about my boys' love of den building and this week they've really enjoyed making a den outside. They wanted to do their reading for school and have their dinner in the den. I really enjoy building with them and watching how their ideas form on the design and decoration of their den. Our dens are mostly quite simple, and quick to set up. Below are some fun den building kits and tools you can use to get started and for inspiration. Our pop-up tent is often the starting point for more elaborate structures. I've had one since my kids were small, and they've had hours of fun playing, reading, and eating picnics in it. A pop-up tent is great for indoor and outdoor dens, and we usually accessorise it with cushions, cosy blankets and teddies. Climbing frames make great dens too. Attach a large throw or waterproof sheet using pegs or the tools from the PL-UG range, and you'll have an instant cosy place. Tracy throws army camouflage netting over her Geodesic Climbing Frame for an instant den that keeps her boys occupied for hours. The Geodesic climbing frame is brilliant, as it's also tall enough for bigger kids to stand up inside and parents to fit in too! Den building kits are a fab way to get started. 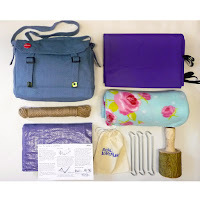 You can buy a kit already made up like the Kids Army Outdoor Adventure Kit or the adorable "Truly Lovely Den Kit". Alternatively, make up your own. Generally these kits include a large waterproof sheet, some pegs and rope and a variety of outdoorsy accessories required for exploration. My kids godmother has a homemade den building kit containing an army camouflage net, magnifying glass, plastic bugs and jewels, wooden pegs, paper and pencils (my boys love visiting and setting up a den using all the bits). For more inspiration we recommend the book "Den Building: Creative Imaginative Spaces Using Almost Anything", a camouflage net and the tool kit by PL-UG for fixing your waterproof sheet or camo net to various surfaces.